Mujirushi, the inexpensive line of “no-brand” merchandise originally designed for the Seiyu chain of supermarkets in the early 1980s, started selling manufactured homes about five years ago. Like Muji’s household products and clothing, all based on simplicity and function, the housing line has since grown and dedicated fans of the brand, called “mujirah,” can now totally immerse themselves in the Mujirushi aesthetic. There are three general designs: the morning house, the wood house and the window house. Depending on the size, it will run you between 15 and 25 million yen. That’s about the same as other, comparably-sized manufactured homes by companies like Sekisui and Tama, except for one striking difference: the Mujirushi house comes with nothing in it–no shelves in the closets, no lighting, no bathroom fixtures. The idea, of course, is that mujirah will outfit their new homes with Mujirushi goods, which is why the designs are flexible. Walls can be moved, room configurations rearranged, panels installed. 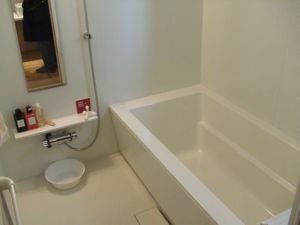 You can opt for one of those cheap, ugly “unit baths” or have a specially Mujirushi-certified tile bathroom installed. You can put in kitchen cabinets or just a floor-to-ceiling sliding door behind which you can stack all the Mujirushi off-white containers your heart desires. Most importantly, you can make the windows any size you want–and you can make them all CLEAR glass rather than that pebbled or clouded glass that other housing companies insist on. Though the product itself is not revolutionary and may, in fact, be out of the price range of most mujirah (you still have to provide the land, of course, which is the real cost of property in Japan), the Mujirushi house could shake up the new housing market substantially. Most manufactured home companies make their money by being inflexible: You have to stick to the design they give you, which is why they have so many of them. Mujirushi only gives you three designs, but enough flexibility within those three so that you can meet your needs and wants easily. The value is in the material and the construction, which means that Mujirushi homes not only qualify for eco points, but also for “long-life housing” tax deductions, since they are built to last much longer than the standard 35 years. Consequently, that also means the resale value will be higher than that for a conventional manufactured home. There are now model homes all over the country.